The Law on Free Legal Aid has been pending for more than 12 years. During this time, lawyers and attorneys at law engaged in civil society organizations provided free legal aid, and some even participated in the Working Group that created the 2015 Draft. The solutions from the current Draft significantly deviate from the solutions that, in accordance with their many years of experience, were proposed by free legal aid providers. The Ministry of Justice has published the latest Draft Law, and has announced that it had corrected the text and edited it in accordance with the submitted remarks. 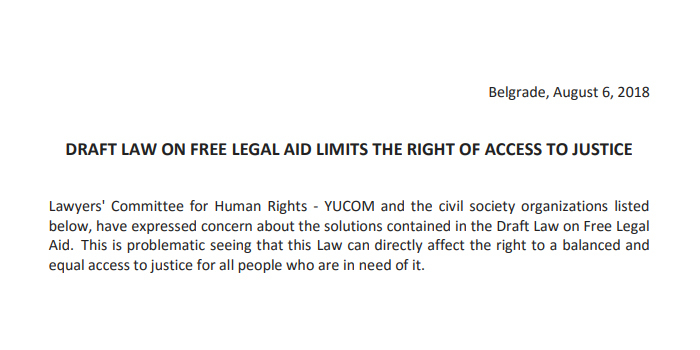 However, the most important remarks submitted by Lawyers’ Committee for Human Rights – YUCOM and other organizations listed below as decade-long providers of free legal aid were not respected. This primarily relates to the limited possibilities of legal aid provision by lawyers and attorneys at law engaged with the CSOs, who have performed this activity, in absence of an adequate law, for the last 20 years. The Draft Law limits CSOs to provide free legal aid only on the basis of the Law on Asylum and The Law on the Prohibition of Discrimination. Concurrently, it neglects other laws, such as the Law on Public Information and Media. The Draft Law brings confusion to existing legal solutions with a very vague provision giving CSOs the right to provide free legal aid; aid that is provided by attorneys at law. We emphasize that the Law on Civil Procedure notes that the legal representative of a party may be an attorney at law, a relative, a representative of the free legal aid service, a lawyer that passed the bar exam representing the legal entity in which he is employed, and a representative of a trade union. In addition to this, the smallest portion of free legal aid services are representations in court or in front of state authorities. Most of them involve free legal advice and submitting briefs. Is Serbia so rich that it can afford to have attorneys at law provide all types of free legal aid? Will attorneys at law be able to respond to all the needs of free legal aid seekers? Instead of giving the state responsibility for providing free legal aid in order to help the citizens of Serbia, the Ministry of Justice presents a Draft Law that will not be economically viable. The Draft Law implements direct discrimination against lawyers in relation to the place where they are employed or engaged. It is unclear why a lawyer employed in a local self-government unit is allowed to provide free legal aid and issue decisions granting a person the right to free legal aid, but the same is not allowed for a lawyer employed by the Center for Social Work, the court, the prosecutor’s office, or in the CSO. In this way, citizens who are in need of legal assistance are negatively affected. The reason being that the Draft Law ties the property census with the right to free legal aid by equalizing it with the census for social assistance and the right to child allowance. This being said, all those who do not fall into this category, or some of the categories separately prescribed by law, shall be denied this type of assistance. It is unacceptable that a law which aims to enable an equal access to justice for vulnerable groups of citizens, such as the Law on Free Legal Aid, limits this right by derogating existing legal solutions and recognizing the right to free legal aid to a very limited circle of persons. In doing so, it denies the assistance being provided by lawyers in CSOs who have been doing this work for years. Lawyers’ Committee for Human Rights – YUCOM and the civil society organizations for human rights protection listed below, do not ask for funding of free legal aid from the state budget, but rather ask for civil society organizations to be enabled to continue providing free legal aid to a wide circle of citizens. In regards to these citizens, this type of aid is necessary for the protection and realization not only of their constitutional rights, but also the rights outlined in several international documents. Above all, this aid is necessary for achieving a universal access to justice for all.